Twinkle Twinkle You're A Star! name tags will help students introduce themselves with confidence. A great way for students and visitors to greet new faces, the Twinkle Twinkle You're A Star! name tags are a classroom essential. 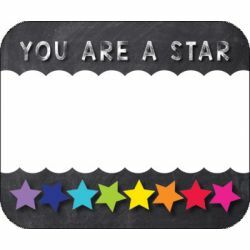 The pack includes 40 self-adhesive name tags—each measures 3" x 2.5" and features the phrase “You Are a Star” with a scalloped name space and a cheerful rainbow star border.